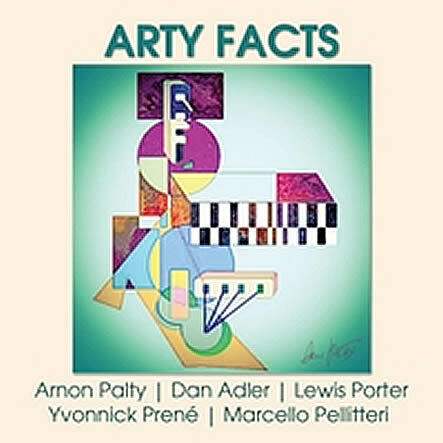 In June 2012, Arnon Palty arrived in New York to record an album of his arrangements with the Dave Liebman Big Band. He brought with him a handful of original compositions he had recently completed in the contrafact tradition (original melodies on standard tunes’ chord changes). When he showed the compositions to his New York friends Dan Adler, Lewis Porter, Marcello Pellitteri and Yvonnick Prene, they all got excited about recording them, and about throwing in a few compositions of their own. Thus the Arty Facts project was born! at the Jerusalem and Tel aviv music academies, Ono-Hed academic college, and at the Rimon school of jazz. His distinctive electric bass sound and upright jazz bass playing has been featured on hundreds of stage and recording productions in Israel and the USA, including live performances with Dave Liebman, Lee Konitz, Phil Woods, Benny Golson, Didier Lockwood, Airto Moreira, Zakir Hussain, and many others. Arnon is also leading his own Big Band and a 10 piece Funk/Fusion group called “Plutonium”, and has recorded several projects with them. Arnon’s composition “S-10” opens the album. Arnon is a fan of phonetic wordplays and puns, and here he was thinking of “four ‘n’ six ‘s ten” as a hint to the underlying original: Wes Montgomery’s Four On Six, itself a contrafact on Summertime (abbreviation ST, just like S10). So, we have a triple-contrafact, if you will. “Moe Meant: No Tease” is another Arnon Palty original built around the form of Coltrane’s “Moment’s Notice”. The pun is obvious, yet the composition is also dedicated to both Moe Howard of the Three Stooges and to The Simpsons’ short tempered proprietor and bartender, Moe Szylack. Dan Adler’s “Yes, Today“, is an original melody on a modified version of the standard “Yesterdays”. By stretching the form, perhaps Adler hoped to put more emphasis on the present than on the past. For further amusement, you can also find a hint of the Beatles’ Yesterday in the beginning of Arnon’s bass solo. Lewis Porter’s “Last April” is built on the form of “I Remember April”, but its slow bossa feel and haunting melody lends a whole different feel to the tune, and puts the soloists into a new frame of mind. “The Daze of Brian and Moses” is an Arnon Palty original on the form of Mancini’s “Days of Wine and Roses” which is full of interesting references to music history. The intro and first phrase are a nod to Charlie Parker’s Confirmation as well as Verdy’s Drinking Song from La Traviata, while the second phrase pays tribute to Dave Brubeck’s “Take Five”. Yvonnick Prene’s original “The Swimmer” is built on Coltrane’s “Giant Steps”, one of the tunes that every aspiring jazz musician cuts his teeth on. The slow samba feel gives the tune a happy dance-like feel. Lewis Porter’s “Long Before I Met You” is based on Kern’s “Long Ago and Far Away”. Porter cleverly disguised the original form with his halftime melody which gives the standard tune a more contemporary feel. Dan Adler’s “Good Old Days” is not based on any specific standard. It superimposes a 4/4 melody over a 3/4 meter, thus creating a feeling of tension and imbalance which often happens when we allow nostalgia to affect our lives. The album closes with Lewis Porter’s “The Storm and Its Aftermath” which is a long modal composition which defies categorization as it evokes many moods and styles, including a feel that may remind of the classic jazz fusion group Weather Report.